When Spotlight was named Best Picture at the Academy Awards on Sunday, it surprised a few people. For the most part, the surprise was a happy one, since Spotlight was a great film that deserved the recognition. However, it’s road to being made was a tough one. At least one major studio considered, and then dropped the film before it finally found its home. At one point it appeared that Disney would be the distributor for Spotlight. Ultimately, Spotlight was just too small for them. As Jonathan King, one of Spotlight’s producers, recently told The Hollywood Reporter, it actually took eight years for Spotlight to go from an idea to an actually produced movie. Much of the problem involved finding a distributor who wanted to deal with what was essentially an independent film. We started talking to distributors and briefly partnered with DreamWorks… but they ultimately realized Disney was probably not the right distributor for it. … Disney is an extremely successful company at releasing big, giant hits. But it's not in a big studio's business plan to make these kinds of movies. Their business plan is to make Deadpool and Jurassic World. I get that, but there is still a vibrant market for these films. The battle of the smaller movie against the big-budget behemoth has always been an issue in cinema, but it seems to be getting worse in recent years. As most studios have gone looking for major franchises to build and "cinematic universes" to create, they are putting even more resources toward these big blockbuster films than they were before. In the end, there is only so much money to go around, and this leaves the smaller films scrambling for whatever is left. As Jonathan King says here, many studios just aren’t built in a way to make these kinds of movies anymore. You don’t produce Spotlight the same way you produce Captain America: Civil War. Also, as Jonathan King points out, the market is there. Another of this year’s major Oscar contenders, The Big Short, brought in about $70 million at the American box office. While that’s peanuts compared to what Deadpool did on its opening weekend, since Short’s budget was less than $30 million, the film was still incredibly profitable. At the end of the day, that’s what really matters to the studio. The giant opening weekend numbers are only useful if they exceed the giant budgets. Winning awards doesn’t hurt either. 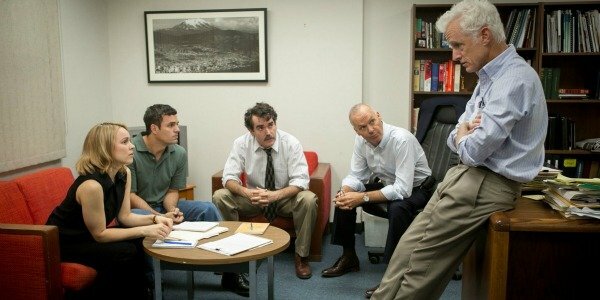 Spotlight is actually being re-released in theaters to capitalize off its Oscar win, which will only make the movie more money at this point. Hopefully, studios will realize that there is still business to be done here, and the next Spotlight will have a slightly easier time.